Many thanks to Sam Silverhawk for the wonderful eagle background. 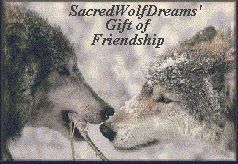 This gift was given to me by Sacred Wolf Dreams. My many thanks for her gift of friendship! This award was presented to me on 7-17-98, with the words "Wado for all the love and caring that lies within your pages". This beautiful award came from a woman that has touched my soul with her kindness and her faith. Please go see both her personal pages and the pages she has designed for O.N.E. This beautiful site award was given to me by Rose on 4-8-98. 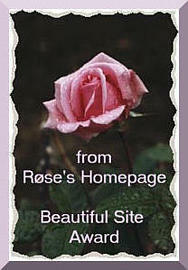 I loved her site the first time I saw it and then a crash took the bookmark away. I searched and searched for it for months and was so happy to find it again. Please go see for yourself her wonderful gardens, warm sense of humor and fantastic color help for all those interested in creating web pages. Thank you, Rose. This 'spiritual essence' award was given to me on 3-17-98, by BABEonHD. Thank you Brenda! This award touches me deeply, as it comes from a very special woman who knows the true meaning of spiritual essence. I really admire her for her determination, intellegence and kind spirit. Please visit her beautiful pages and you will find that she has something there for everyone. I would like to give special thanks to Teri (aka Angeltwin) for this award. It came as a wonderful surprise after having this web page for only 1 month. Please go visit her site and let her know you were there. This fantastic award was given to me on 1-14-98 by Jazzy. My heart-felt thanks. Please go visit this wonderful site and sign the guestbook. Jazzy's a little piece of heaven. 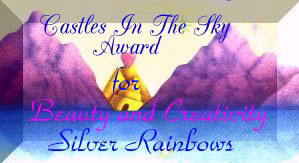 On 2-28-98 I received this beautiful award from little white wolf. This is really an a honour coming from someone who has such a wonderful Native American site. Stop by and enjoy her place, and let her know you were there. This award was presented to me on 1-10-98 by Katie at "Morning in Glory". Thanks a million! Please go visit her.